Two young children push a dolls carriage and carry signs in support of their parents' strike. Their signs read "Strike!" and "I Need a Healthy Diet!" 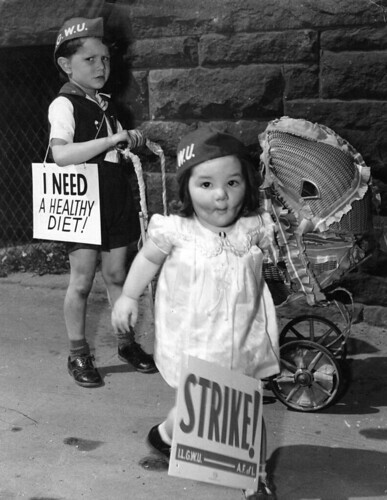 Title: Two young children push a dolls carriage and carry signs in support of their parents' strike. Their signs read "Strike!" and "I Need a Healthy Diet!" Notes: Identical to 5780PB33F7H. No additional information available.